Register with us and receive information updates of the latest developments on this site and offers exclusive to this site FREE!. To change your details enter new information, select modify data and submit. If you are currently registered and wish to unsubscribe, enter your email address and select unsubscribe. Financial Institutions offering deposits and savings products generally publish a standard rate. However, in many instances deposit rates can be negotiated depending on the amount to be deposited and also the client’s relationship with the organization. A deposit of funds placed at a financial institution, where the depositor earns a fixed rate of interest for a fixed period of time. Fixed Deposits can be for short, medium or long term. Funds can only be withdrawn before the maturity date with prior notice and could attract a penalty. A depositor has the facility to borrow funds from the institution using the deposit as collateral. A deposit of money where the depositor earns a fixed rate of interest, for a fixed period of time. However, in the case of a certificate of deposit the investor deposits the discounted value of the certificate of deposit and receives the full value of the certificate on maturity. There are four types of foreign currency accounts that are generally operated in Sri Lanka. Personal Foreign Currency Account (PFCA) is a special account which can be opened in designated foreign currencies and could be invested in many attractive investment products. Inward Investment Account is a special account designated for eligible investors, resident in or outside Sri Lanka to route funds to invest in permitted investments.Licensed Commercial Banks and Licensed Specialized Banks (as permitted) are permitted to open and maintain IIA in the Domestic Banking Unit of a Licensed Commercial Bank and Licensed Specialized Banks (as permitted) in the name of the eligible investor. IIA may be maintained in Sri Lanka Rupees or in any designated foreign currency and may be held jointly by eligible investors. OIA is a special account designated for persons resident in Sri Lanka to channel funds abroad for eligible overseas investments such as investments in Shares, Units, Debt Securities, Sovereign Bonds and establishing of an overseas company of a company incorporated in Sri Lanka. Licensed Commercial Banks are permitted to open and maintain OIA in the name of resident investors in the domestic banking unit of a Licensed Commercial Bank in any designated foreign currency. The following institutions are authorized by the Central Bank of Sri Lanka to accept deposits of money from the public. Savings accounts are interest bearing instruments and can be broadly categorized in to three groups. This is the standard product offered by institutions. The main feature that differentiates one institution's product from another is the basis of interest calculation. I.e : Interest can be calculated on the account balance, daily, weekly, monthly or any other period as decided by the institution. Funds can be withdrawn from a savings account at any time. Banks and other institutions authorized to operate savings accounts offer many types of schemes, in order to attract savings, by offering varied benefits to the saver in addition to the interest rates paid. Licensed Commercial Banks are authorized by the Central Bank of Sri Lanka,to operate savings accounts in currencies specified by the Central Bank. Foreign currency savings can be operated through the following accounts. The following Institutions are authorized by the Central Bank of Sri Lanka to operate savings accounts. A detailed list of these organizations and their contact information can be found in the Directory under the relevant categories. Further inquiries can be made with the Central Bank of Sri Lanka, which regulates these institutions. Treasuries are securities issued by the Central bank of Sri Lanka on behalf of the government of Sri Lanka to fund the government budget through public borrowing. There are two types of securities which are commonly issued. The Treasury Bill and the Treasury Bond. Interest and Maturity proceeds of Treasuries are guaranteed by the government of Sri Lanka. Treasury Bills and Bonds are issued in scrip-less form and transactions are recorded electronically in the LankaSecure system of the Central Bank. Treasury Bills are promissory notes issued by the Central Bank of Sri Lanka on behalf of the government of Sri Lanka, which stipulate that the holder of the Treasury Bill will be paid the face value on a specific date. Treasury Bills are zero coupon securities and are sold at a discount to the face value which is paid at maturity. The difference between the purchase price and the face value is the interest income to the investor. Treasury Bills are considered liquid assets, as they can be easily converted to cash. Treasury Bills are issued in three maturity periods - 91 days, 182 days, 364 days, at the weekly auction held by the Central Bank,and can be purchased from Primary Dealers who are appointed by the Central Bank to competitively bid and purchase Treasury Bills at the auctions. Treasury Bonds are medium to long term securities issued by the Central Bank on behalf of the government of Sri Lanka. The maturity periods of Treasury Bonds issued to date, range from 2 years to 30 years. Treasury Bonds carry a coupon which pays the holder of the bond a fixed rate of interest semi-annually. While Treasury Bonds are issued at par, they can be purchased at a discount or a premium depending on the prevailing market interest rates. Treasury Bonds are issued at auctions held by the Central Bank and can be purchased from Primary Dealers who are appointed by the Central Bank to competitively bid and purchase Treasury Bonds at the auctions. This is an agreement between two parties which involve the sale of securities (usually Government Securities) at a specific price with a commitment to repurchase the same or similar securities at a fixed price on a specified future date. The difference between the sale price and repurchase price is the interest income. Popularly known as “repo” the transaction is generally short term in nature and within the maturity date of the security offered. A flexible instrument, which offers a method of short-term funding for dealers in Treasury Bills/Bonds and an attractive and secure avenue of investment for investors. Rates are competitive and market driven. A repo is similar to a loan that is collateralized by the securities underlying the agreement. The repo agreement is called a reverse repo when viewed from the perspective of the securities buyer. Investors in Treasury Bills/Bonds can pledge their securities and borrow funds to meet short term needs. Rates are generally competitive and market driven. The Yield Curve is a graphical representation of yields of specific maturities at a given point in time. Primary Dealers are specialized companies who have been appointed by the Central Bank to buy and sell Treasury Bills and Bonds. Besides the commercial banks that have been issued a primary dealer license by the Central Bank, Primary Dealers are the only companies permitted to participate in the Central Bank’s primary market auctions for the issue of Treasury Bills and Treasury Bonds. Investors who wish to buy and sell Treasuries or bid at the Treasury Bill/Bond auctions can contact these companies. 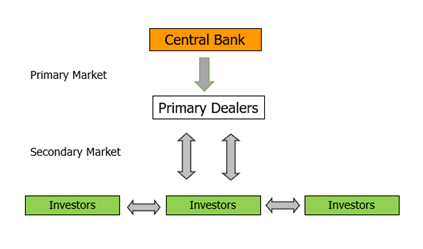 Transactions other than those at the Central Bank Auctions (primary market) are treated as secondary market transactions. The Colombo Stock Exchange (CSE) has facilities for the secondary trading of Corporate and Government Debt Securities. Participants have the luxury of carrying out the trading of Equity and Debt Securities on a single trading platform. For Debt Securities investors have a choice of doing trades on two separate settlement boards. Accordingly, cash settlement can be done on T+1 or T+2 and Debt Securities Settlement is on DVP (Delivery versus Payment) basis. Participants also have the facility to do negotiated trades through the Crossing Board. A “Unit Trust” is a pooled investment plan where the capital contributions of investors are combined into a legally formed Trust Fund. The money is then invested by professional Fund Managers, acting on behalf of the investors, in a portfolio of marketable securities. A “Trustee” is appointed to safeguard the rights and interests of the investors. The investors receive “Units” (shares) in proportion to the amount of money they have contributed to the Fund. The income derived by the Fund by way of dividends, interest and capital gains are divided among the unit holders in proportion to their investments. 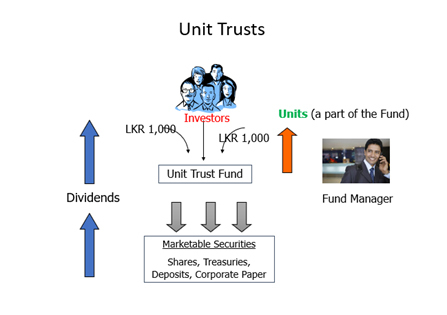 Unit Trusts are regulated and licensed by the Securities & Exchange Commission of Sri Lanka (SEC). Structurally these unit trusts can be identified as Open-end and Closed-end Funds. Open-end Funds are not limited by the number of units they can issue and do not have a maturity date. Investors can invest in or divest their investment at any given time. Closed-end Funds generally issue a fixed number of units and have a time period during which they will mature,and the investors will be paid back. Investors can invest only up to the number of units offered by the Fund. Withdrawals will depend on the conditions set by the Fund in the Explanatory Memorandum. Some companies opt to list these Closed-end Funds on the Colombo Stock Exchange (CSE) in order to provide an avenue for investors to withdraw from the Fund before its maturity. These Funds primarily invest in the stock market. Equity Funds carry a high level of risk and are expected to provide a high return in the long term. The following Fund types can be considered as Equity Funds. Equity Index Funds – Funds which allocate Assets (construct portfolio) to match or track the composition of a specific index. These Funds invest in a combination of equity and fixed income securities. They have a higher risk level than Income Funds but are expected to provide a higher return in the long term, by way of capital appreciation and dividend payments from time to time. There are two types of Asset Management Companies, which are regulated and licensed by the Securities & Exchange Commission of Sri Lanka. Unit Trust Management Companies generally manage many types of Unit Trusts. Some companies have also obtained an Investment Manager’s license from the Securities & Exchange Commission of Sri Lanka to manage Private Portfolios of investors. Contact details of these Unit Trust Managers can be found in the Directory under Asset Managers. Investment Managers are persons who for a fee or commission engage in the business of managing a portfolio of securities on behalf of an investor or advise any person on the merits of investing in Securities. An Investment Manager, however, is not permitted to manage Unit Trusts without obtaining the specific license to manage them. Investment Managers manage portfolios in equity and fixed income securities and cater to both individuals and corporate investors. In addition to investing in the Stock Market (Colombo Stock Exchange) Expatriate Sri Lankans and Non-Nationals are currently permitted to invest in Unit Trusts. Investors who wish to repatriate funds can do so by opening an Inward Investment Account (IIA), which is a special account that facilitates such transactions. Home loans are granted for the purchase of a house,a land, to construct a house, complete extend or renovate an existing house or refinance a housing loan obtained from another lending institution. Repayment periods on home loans are generally within 5 – 20 years. However, some institutions offer up to 30 years, subject to the applicant's retirement age not exceeding the repayment period. The fixed rate of interest gives the borrower a rate of interest that will prevail during the full period of the loan, and also a fixed amount on the installment. The floating rate of interest is based on a benchmark rate and will fluctuate depending on the movement of the benchmark. [The typical benchmark for home loans could be the Average Weighted Fixed Deposit Rate (AWFDR) of the Commercial banks plus a premium]. The loan installment would change with each change in the benchmark. The Loan is generally secured by a primary mortgage over the property. Most lending institutions have similar criteria in assessing the eligibility of home loan applicants. Some of the most common criteria are listed below. Applicants (if individuals) should be able to meet living expenses after paying the loan installment. The monthly installment generally does not exceed 40% of the applicants net monthly income. Letter from the vendor for the purchase of property. Bill of Quantities for proposed construction acceptable to the lending institution. Valuation report of property to be mortgaged, from a valuer acceptable to the lender. If self-employed proof of income. Letter of employment contract for required period if employed abroad. Copies of passport and visa documents. Assessment notice – receipt in respect of assessment tax. The “Viyana” loan scheme exclusively serves Employees Trust Fund Board (ETFB) members, who are eligible to borrow for the purpose of purchasing or constructing a house, extension or improvement of a house. Loans are given with the agreement of the ETFB and the lending institution. The applicant should be currently employed at an organization that is approved by both the lending institution and the ETF Board. The lending institution will secure a mortgage over the property. Repayment of the loan is through a pay sheet deduction arrangement. Some institutions offer foreign currency home loans to Sri Lankans working overseas. These loans are granted for housing in Sri Lanka and can be obtained and repaid in foreign currencies as permitted in the specific Foreign Currency account. Most lending institutions have minimum loan amount requirements. Repayment of the loan is generally over a period of five years. Most other conditions applicable to home loans are also applicable to foreign currency loans too. See 'Home Loans – General Features'. Corporate housing loans are generally offered to a company to provide housing facilities for its employees. Lending institutions offer various methods of financing for Corporate Housing. The rates of interest, the period of the loan and the security required by the lending institution will differ for each company and depend on the performance of the company and the security/guarantee offered. Personal loans can be obtained for varied personal purposes. Monthly salary should be remitted to an account at the lending institution or a standing order for the installment to be paid to the lender. Educational loans can be obtained for educational and career advancement purposes. This includes money to purchase books, pay tuition fees and even purchase educational items such as computers. Loans are available at various stages of your educational career ranging from college through university and post graduate studies, also for professional studies. Some organizations also grant loans to meet career development expenses such as training or commencing a professional practice. Loans are generally secured by personal guarantors or in some cases against the mortgage of immovable property. Loans can be obtained jointly with an adult (parent) or alone if the borrower has a regular income. A marketplace (exchange) created by the Colombo Stock Exchange (CSE) for the transaction of secondary market Treasury bills and Bonds. The intermediaries on the DEX are the stockbrokers and debt dealers appointed by the CSE. The SIERA is a transactional account used for the purpose of making investments in Sri Lanka using foreign currency. The Investor who brings in foreign currency is permitted to repatriate the investment and profit without specific exchange control approval. Funds payable pertaining to Stock borrowing and Lending SStransactions. Inward remittances or NRFC/ FCBU transfers of the investor. Commissions relating to item 2 and 3 above supported by SSdocumentary evidence. Funds received from participating in Stock borrowing and SSLending transactions. The purpose of this account is to encourage persons who are citizens of Sri Lanka and are resident outside Sri Lanka, to remit their foreign exchange earnings for investment in Sri Lanka. Citizens of Sri Lanka who have made their permanent place of SSabode outside Sri Lanka. Citizens of Sri Lanka who have proceeded outside Sri Lanka for SStaking up employment or setting up a business or profession and SScontinue to reside abroad. RANSI should be opened only with the proceeds of foreign exchange received through a licensed commercial bank, appointed as an authorised dealer to the credit of the person opening the account. The account should be opened in the domestic unit of the bank and should be maintained in Sri Lanka Rupees. Interest earned on funds lying to the credit of the account. Income derived from investments made out of funds in the SSaccount. For capital funds required for making investment in securities SSsuch as shares, government securities, debentures and units in SSunit trusts and other financial assets and real assets including SSland and buildings. For outward remittances from funds lying to the credit of the SSaccount. for any other local disbursements.